Math is a skill that is integrated into almost all aspects of our lives. While children receive formal math instruction starting in Kindergarten, even at a very young age, they can begin to learn fundamental math concepts through play and engaging activities. 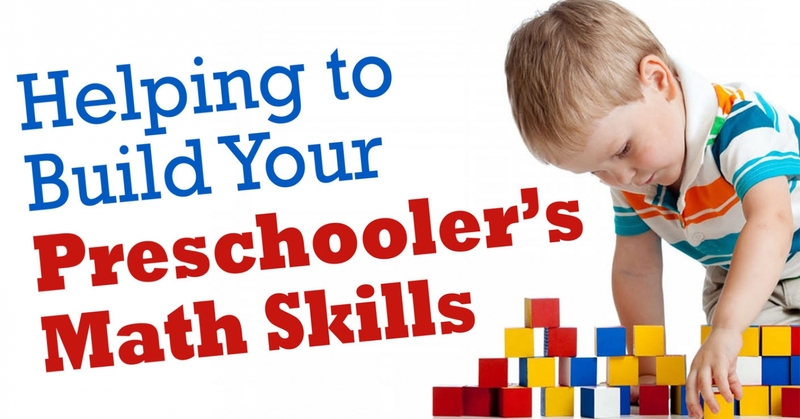 Try some of the ideas below to build your preschooler's pre-math skills. Turn an outing at the park into a math-oriented learning experience. Have your child collect a bucket full of various types of pebbles and then lay them out on a flat surface. Ask him to sort the pebbles based on various attributes - color, shape, size, etc. Then have him count the number of pebbles in each group. For a higher level math experience, create a graph on a white board or sheet of construction paper, and write a tally mark for each pebble in the group. Then discuss which group had the most and least number of pebbles and compare the numbers. You can do this same activity with shells at a beach, buttons, or various types of toys. Learning to recognize and identify shapes is an important early math skill. To develop this skill, cut out various shapes using construction paper and discuss their attributes with your child. Ask her to tell you how many sides she sees on a square, triangle, rectangle, and so on. You can even cut out larger colored shapes and play a "jumping" game, where you tell her to jump on the red triangle, for instance, then the purple circle, orange square, etc. When you are driving or walking outside, point out various shapes that you encounter in the "real" world - a triangle shaped road sign, a circular wheel, or a rectangle shaped price tag at the supermarket. Help your child understand patterns using every day household items. Take out dry pieces of pasta, cereal, beads, gummy bears, and the like. Have him first create patterns that you dictate - pasta, gummy bear, pasta, gummy bear, for instance, then perhaps cereal, pasta, gummy bear, cereal, pasta, gummy bear, and so on. Then he can create his own patterns while you supervise, starting with basic patterns and eventually encouraging him to try more complex ones. You can also ask your child to look around for patterns on common items, such as clothing, tablecloths, toys, pillows, and curtains, and even play "I Spy" with various pattern-containing items. When you cook dinner, try presenting the food in a pattern, such as pea, corn, pea, corn, etc., and see if your child notices. Remind him that patterns are everywhere! Most kids love playing with blocks. You can integrate pre-math skills by asking your child to build two different towers using blocks, then compare them. As her which tower is taller, which is shorter, and how many blocks were used to create each tower. You can play a matching game with colored blocks by having her match two of the exact same blocks and then having her tell you the shape and color of each block. For an additional sonsory experience, encourage her to experiment with different types of blocks: wood blocks, foam blocks, mirror blocks, magnetic blocks, prism blocks, and so one. These various types of blocks will add to the fun of early learning. Help your child understand time at a young age. Try using a timer to time short activities - those that take 1-3 minutes or so. For instance, time him brushing his teeth, getting dressed, or building a tower. ‎Discuss which tasks took longer, how much longer one task took than the other, and so on. Also talk to him about what time he does certain activities. For instance, he might wake up at 7:30am, go to school at 8:30am, and eat dinner at 5:00pm. Practicing these time-oriented skills will help your child with time management skills down the road. Young children love to play. Engage your child in these play-oriented activities and help him develop strong pre-math skills. He will ultimately develop a joy for learning along with the foundations for math success. Dr. Emily Levy is the founder and director of EBL Coaching. 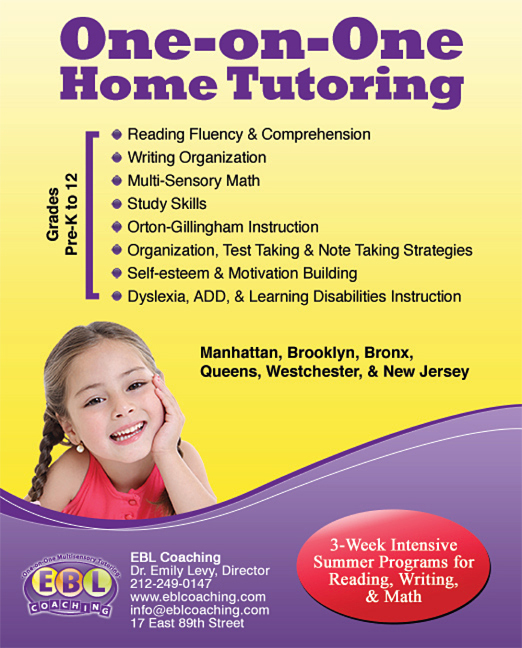 EBL Coaching provides one-on-one home and on-site tutoring in reading, writing, math, organization, and executive functioning skills. Learn more about EBL by logging on to www.eblcoaching.com, calling (212)249-0147, or e-mailing info@eblcoaching.com.